Local Rochdale charities launch an initiative offering people a different way to give to tackle homelessness. 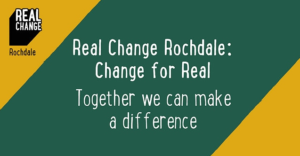 Real Change Rochdale raises money for practical items which help people who are homeless: things like a deposit for a home, enrolment on a training course or buying new clothes for a job interview. Donations go directly to people who are homeless or at risk of becoming homeless via local charities and voluntary groups such as Petrus, Sanctuary Trust, Stepping Stone and Angie’s Angels. Over £1000 has already been raised to kick-start the scheme, with Rochdale College Sixth Form winning the ‘Real Change Challenge’ competition set for supporters and partners. 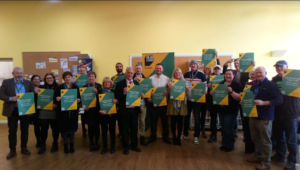 The campaign is now looking for more people, workplaces and community groups to fundraise on behalf of Real Change and help tackle homelessness in their community – with more information about how on their website at www.realchangerochdale.co.uk. “Individually, each of us can do something, but together we can make a Real Change to homelessness in our area”. Real Change is based on the Big Change initiative in Manchester, which has raised over £250k to help end homelessness since it started in 2015. Real Change Rochdale builds on the experience of the Big Change Rochdale campaign which ran in 2017.